Heat oil, add cuminseeds, allow to splutter. Stir fry till oil separates. Add salt, garam masala, and ½ cup water. Allow to simmer for 2-3 minutes. Add all vegetables. Mix well. 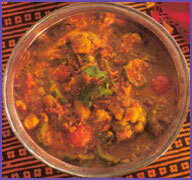 Cook till masala thicken enough to coat vegetables. Add lemon juice, mix, take off fire. Garnish with chopped coriander, serve hot. Santa Monica Restaurants Find New Ways to Attract Attention!